On their first date Sinéad was two hours late - leaving Chris, he says, without any high hopes for her being on time for the wedding day (Sinéad says she tried 'so hard' to be on time on the big day, insisting today that she was a mere five minutes behind schedule). Chris attempted to pop the question while the pair were on holiday in Lombok, Indonesia, after they had embarked on a 2am hike to view the sunrise from the top of a volcano, however Sinéad admits she wasn't in the best mood after the tough climb, and so he decided against it. The next time he attempted to propose was on the roof of their London home, which he had covered in tea lights in an effort to make for a romantic backdrop to the big question. Unfortunately it began to bucket down and he was forced to bring everything indoors. When Sinéad arrived home from work, soggy from the rain and a little grumpy at Chris not agreeing to pick her up from the tube station, she quickly forgot about the miserable day when she saw him down on one knee, amid the tealights, a bottle of Champagne on the coffee table... She still has the cork. 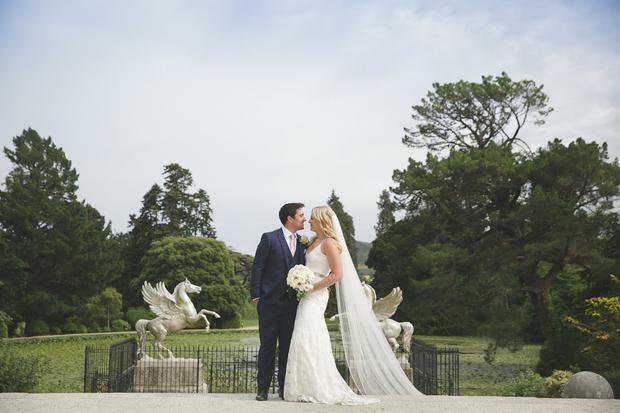 The pair tied the knot in The Church of the Annunciation Rathfarnham, Dublin, before a reception in Powerscourt House and Gardens, Wicklow during the summer of 2017. Not one for being the centre of attention, Sinéad found wedding dress shopping a bit of a daunting experience, which she admits she had been dreading. 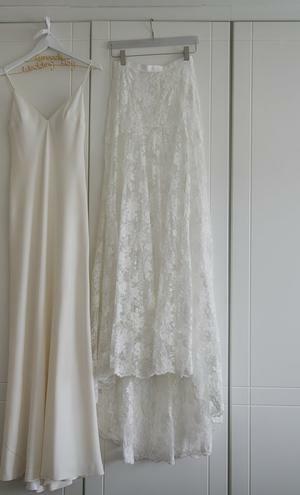 Her mother flew over to London to visit a few bridal shops with her and eventually they found 'the one' in Mayfair - a beautiful silk spaghetti strap slip dress complete with leather waist belt by Charlie Brear which she says was perfectly reflective of her own personal style - even if not traditionally very 'bridal'. 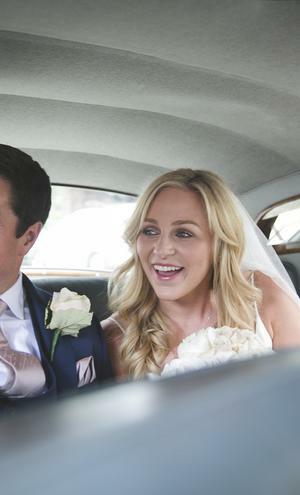 "Charlie Brear a breath of fresh air for a non-traditional bride," says Sinéad. 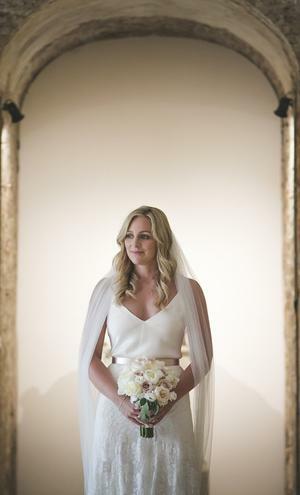 "Hannah and the stylist team are a dream to work with, they listened to what I wanted and helped her get over the initial weirdness of being in a white dress with a veil. They store even shut down the female only studio so Sinead’s father could see his daugher in her gown before anyone else. According to Sinéad, her father said “she’ll do” before picking out a pair of Jimmy Choo Romy flats to match her belt ("the man has impeccable taste!"). "This was the hardest thing for us," explains Sinéad, "we were worried about the cost and hassle for all of our loved ones travelling either to Ireland or England depending on where we chose." They considered eloping and not telling anyone, admits Sinéad, but thought they'd regret it, and possibly hurt people who may have wanted to celebrate with them. "We had a “catholic light” ceremony," says Sinéad, "we were very lucky that Father Kevin let us include the traditional elements that were important to us and our families but exclude anything we felt might be too “preachy” which might have made the English contingent feel alienated." 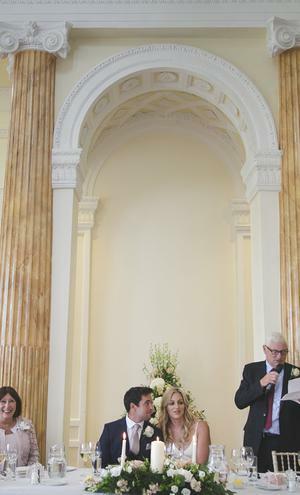 "Our three-year-old niece breaking all the rules and throwing flower petals everywhere and my mum organising “Moon River” to be sung during the signing of the registry made the ceremony very special" she says. For Sinéad, spending the night apart before the big day was a strange feeling, and she says that not speaking on the morning meant that they had loads to catch up on - at the ceremony! "Afterwards everyone kept asking what we were talking about because we whispered and laughed through the whole thing!" she says. 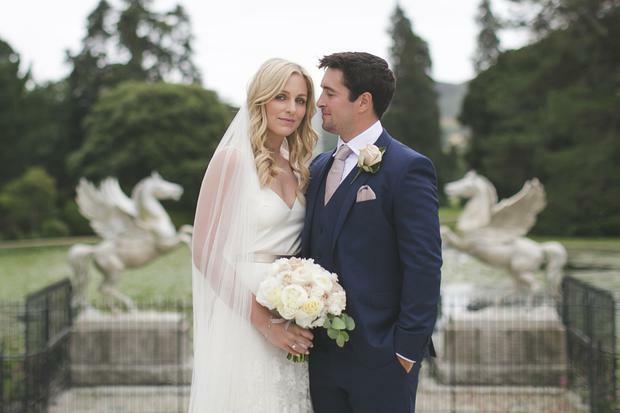 The entire day was perfect for the pair, but there were some moments which really stood out: "The horses in the fields of Powerscourt joining in on our photos, our mothers crying while bringing up the gifts in the church - they claim they were laughing - our family and friends getting along like they had known each other forever, the speeches, G&Gs - Guinness and Gin - which should never be drunk again, our first dance (Upload were delighted to learn how to play Sam Smith’s version of “Latched” for us), sorry we could go on forever!" 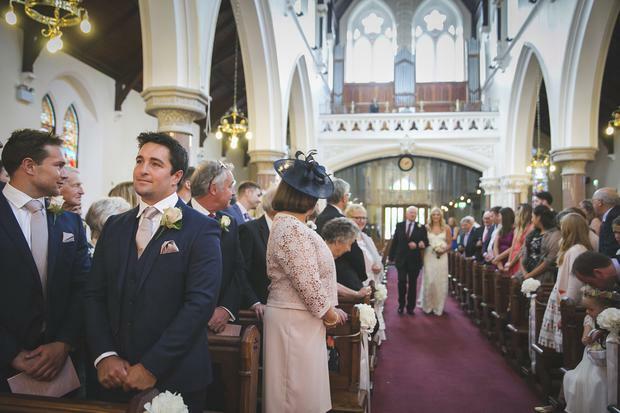 "For both of us, having both sets of Chris’ grandparents travel from the UK to be at the wedding still makes us a bit teary eyed as they are all in their 90s so it meant the world to us to have them there." 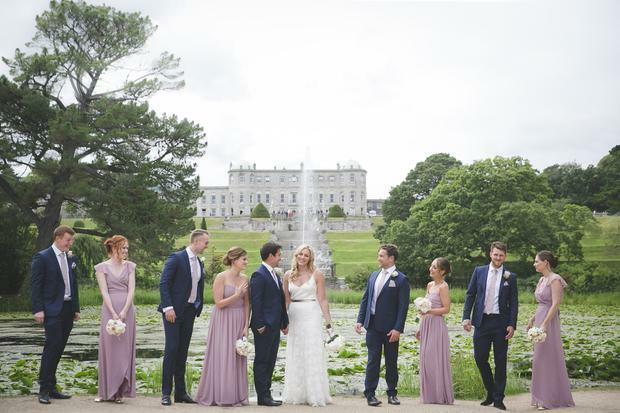 "Chris wanted us to get married in Ireland," says Sinéad, "and I grew up visiting Powerscourt House and the waterfall constantly. I was secretly dreaming of getting married there but didn’t tell Chris until he had picked it for himself!" The pair booked to see a handful of venues within a couple hours driving distance of Dublin, given the numbers which would be travelling from abroad. 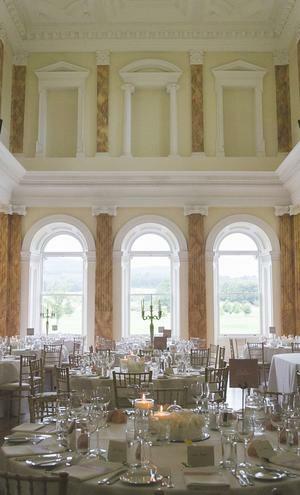 Powerscourt House was the first venue visited. 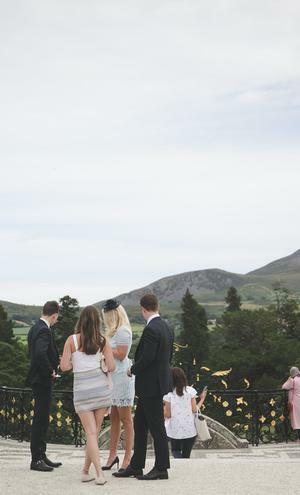 "The sun shone and Chris was in love because, let’s face it, on the rare sunny days we have in Ireland there is really nothing like the Wicklow mountains." Chris and Sinéad's wedding menu was chosen by their parents, and the day was catered for by Feast. On the menu was Irish smoked salmon, sea bass or pork tasting plate and classic lemon tart for dessert. Evening food was a mix of mezze tapas. 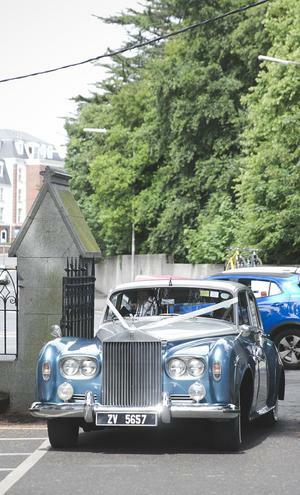 The wedding cake was designed by family friend Eoin Cluskey, owner of Bread41 on Pearse Street in Dublin. "It looked and tasted incredible," says Sinéad. "I think it is probably the first time in history there wasn’t a single piece of wedding cake leftover or thrown out - everyone still talks about it." 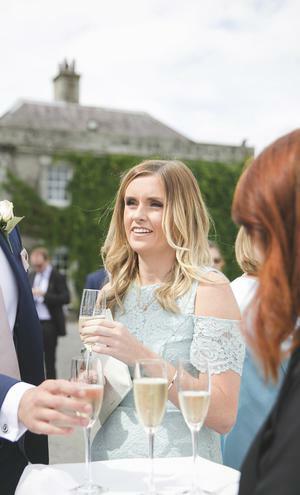 For the drinks reception on the garden of Powerscourt House they served champagne and Pimms with Teddy’s ice cream - a surprise Sinéad planned for her new husband. "99s are Chris’ favourite and Teddy’s ice creams where a huge part of my childhood," says Sinéad, "we still visit Teddy’s every time we are back in Ireland - even in the depths of winter." The couple kept things elegant and clean, however they added a few DIY elements to their decor. 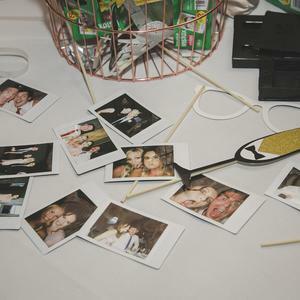 "Our wedding favours were pretty DIY," says the bride, "myself and my poor maid of honour Shona spent hours building lazer cutout boxes to house miniature macarons made by Eoin Cluskey of Bread41 in Dublin, tying them with ribbons to match the bridesmaids' dresses and then filling miniature envelopes with scratch cards in the hope somebody would win a fortune and share it with the newlyweds!" 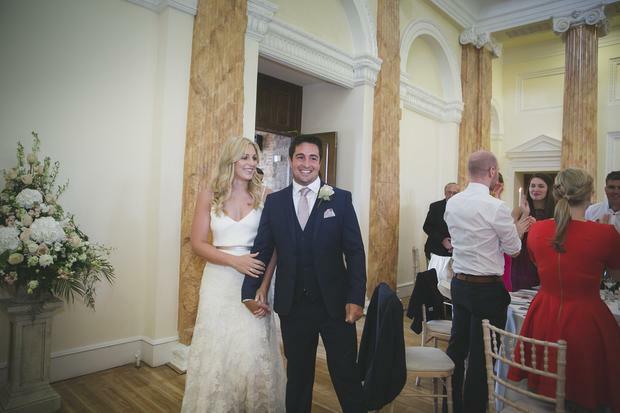 Chris organised the couple's honeymoon, which saw them flying to the Maldives a few days after the wedding. "It was two weeks of bliss," says Sinéad, "no phones, no internet, just empty sunny beaches, snorkeling and time to enjoy being newlyweds!" 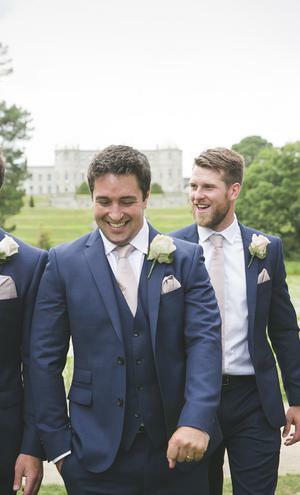 Chris and his groomsmen were "the most relaxed men on the planet" when it came to suit shopping, Sinéad says, and one weekend took themselves off to explore Oxford Street in London to find suits. "Between coffee and pizza they picked classic blue French Connection suits which were perfect as they guys are different heights and builds and French Connection catered for them all". Their ties and pocket squares came from the cravat company online. Sinéad's bridesmaids wore gowns by Joanna August, and she went for two different styles of dress so that the girls could feel most like 'themselves'. "I can’t recommend this brand enough," she says, "incredible designs in a wide range of colours and fabrics, all the gowns come extremely long though so need to be taken up." While the couple enjoyed every moment of the day itself, there is one one thing they feel they could have done without before it - the worry. "You want to give everyone an incredible day, says Sinéad "but really we are so lucky that we are so loved by our family and friends that we could have stuck them in a bike shed with cheese and tayto sandwiches and they would have been happy. "Be yourselves, it’s one of the few times where you can do absolutely anything you want so don’t follow rules and traditions that don’t reflect you as a couple or your life together." 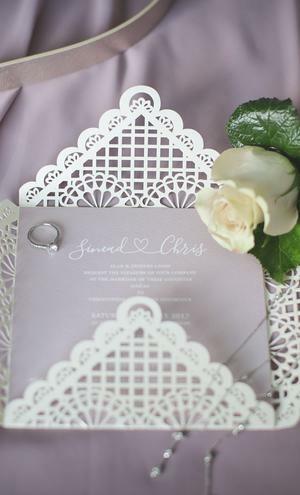 Would you like to share your big day with readers of THEVOW.ie? We want to hear from you! 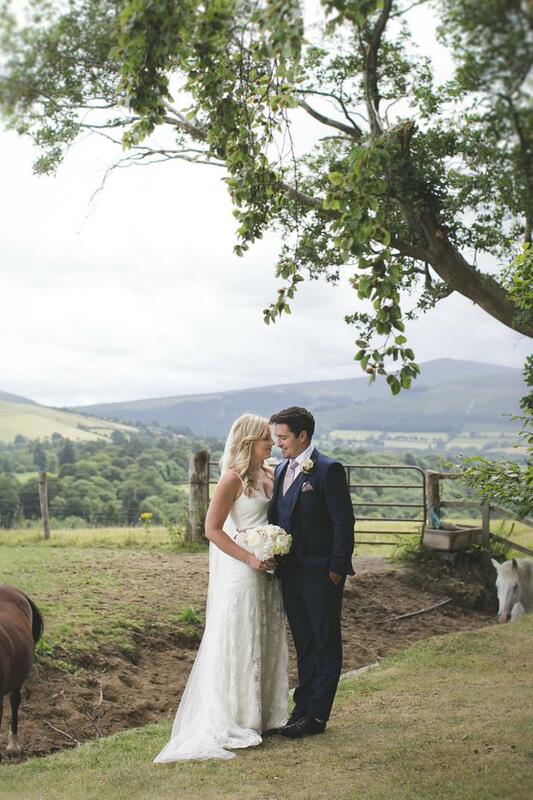 Simply mail editor@thevow.ie with the name of your photographer, your venue, and one or two photos from your day and we'll contact you for more details if we decide to feature it right here.